William Henry Devereaux, Jr., spiritually suited to playing left field but forced by a bad hamstring to try first base, is the unlikely chairman of the English department at West Central Pennsylvania University. Over the course of a single convoluted week, he threatens to execute a duck, has his nose slashed by a feminist poet, discovers that his secretary writes better fiction than he does, suspects his wife of having an affair with his dean, and finally confronts his philandering elderly father, the one-time king of American Literary Theory, at an abandoned amusement park. 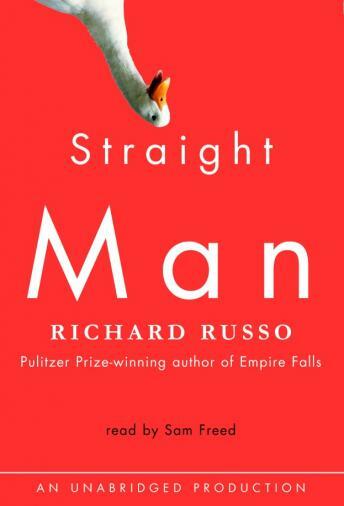 Such is the canvas of Richard Russo's Straight Man, a novel of surpassing wit, poignancy, and insight. As he established in his previous books -- Mohawk, The Risk Pool, and Nobody's Fool -- Russo is unique among contemporary authors for his ability to flawlessly capture the soul of the wise guy and the heart of a difficult parent. In Hank Devereaux, Russo has created a hero whose humor and identification with the absurd are mitigated only by his love for his family, friends, and, ultimately, knowledge itself. Unforgettable, compassionate, and laugh-out-loud funny, Straight Man cements Richard Russo's reputation as one of the master storytellers of our time. Such a fun read! Russo writes in a very playful voice and this carries over to audiobook exceedingly well. The humor is seemingly effortless. You don’t need a PhD to get the humor, but well-read readers will get a few extra jokes I think! Mean spirited and sardonic - trite story about a disgruntled college professor who lusts after all the women. Saul Bellow and Philip Roth do it better!